Keystone pipeline protests: Oil companies will just use railroads. Is the Keystone XL Pipeline Worth Getting Arrested For? While opponents protest, oil companies turn to railroads. Julian Bond, Michael Brune, Bill McKibben, and Lennox Yearwood protest against the Keystone XL Pipeline at Lafayette Park on Feb. 13 in Washington, DC. Last week, four dozen opponents of the Keystone XL pipeline, including Robert F. Kennedy Jr. and environmental activist Bill McKibben, were arrested after they engaged in civil disobedience near the gates of the White House. Some of the activists attached themselves to the fence around the White House and others refused to move after being ordered to do so by U.S. Park Police. On Sunday, tens of thousands of people marched in Washington, D.C., to protest the pipeline project. The demonstrators are hoping to convince President Obama to reject federal approval for the line, which aims to carry crude oil from Canada and North Dakota’s Bakken Shale to the U.S. Gulf Coast. But if opponents of the Keystone pipeline are going to stop the flow of crude, they are going to have to do more than just get arrested or hold a rally—they are going to have block nearly every north-south rail line in North America. When it comes to the flow of northern crude to U.S. refineries, here’s the reality: No Keystone XL? No problem. While opponents of the pipeline have been rallying their supporters, U.S. and Canadian railroads have been hauling record amounts of oil. Last year, the volume of oil delivered by rail in the United States jumped by about 46 percent compared with 2011. According to the Association of American Railroads, oil-related rail traffic increased in Canada by 30 percent. In December, U.S. and Canadian railroads were hauling about 1.9 million barrels of oil and refined products per day, double the volume moved in 2009. Of that total, about 1 million barrels per day is being railed in the United States. The Keystone XL is designed to transport 830,000 barrels per day. Over the past two years or so, domestic railroads have increased their transport capacity by an amount equal to about 55 percent of what Keystone is supposed to provide. There’s nothing new in moving oil by rail. In the late 1860s, John D. Rockefeller began investing in railroad tanker cars, a move that saved him the cost of building barrels to hold his product. The oil baron’s control over the Cleveland-area refining market allowed him to negotiate favorable shipping rates with the railroads. U.S. and Canadian oil producers aren’t waiting for the Keystone XL or other pipelines; they are building rail-car terminals so they can ship their product to market. In North Dakota alone, oil producers have built rail terminals capable of handling nearly 1 million barrels of oil per day. Refineries are also building rail terminals. Last month, Delek U.S. Holdings, a subsidiary of the Israeli energy company Delek Group, announced that it will begin refining 15,000 barrels of Canadian crude at its El Dorado, Ark., refinery. All of that oil is being shipped in by rail. A refinery in Delaware, owned by PBF Energy, recently completed a rail terminal that will allow it to take up to 110,000 barrels of crude oil per day. The Sunoco refinery in South Philadelphia as well as a Phillips 66 refinery in Bayway, N.J., are also ramping up their ability to accept more crude by rail. In addition, Braziel points out that the railroads are eager to work with the oil industry, especially since their once-reliable coal-hauling business is getting hammered as electric utilities are shutting down many of their coal-fired plants and replacing them with natural gas-fired ones. While U.S. and Canadian railroads are hauling most of their crude south and east, a group of Canadian businessmen is aiming to build a huge rail project that could haul 5 million barrels of crude per day northwest from Fort McMurray, Alberta, to Valdez, Alaska, where it could be loaded onto supertankers. The proposal has reportedly received approval from native tribes in Alaska and Canada and could begin operating as soon as 2018. There’s no doubt that developing Canadian oil sands will contribute to climate change. All hydrocarbons—coal, oil, and natural gas—emit carbon dioxide during combustion. But blocking a pipeline isn’t the same as blocking the flow of oil. Billions of dollars are riding on the fate of Keystone XL. If the Obama administration stymies the project, a big loser will be TransCanada, the Canadian firm that’s trying to build the $7 billion project. The biggest winner from a halted Keystone XL will be the railroads. And of them, the biggest winner might just be the Burlington Northern Santa Fe, which is owned by Berkshire Hathaway, the conglomerate controlled by Obama supporter and Omaha billionaire Warren Buffett. In December, the CEO of BNSF, Matthew Rose, said that his railroad was shipping about 500,000 barrels of oil per day out of the Bakken Shale in North Dakota and that it was seeking a permit to send “crude by rail to the Pacific Northwest.” He also said the railroad expects to “eventually” be shipping 1 million barrels of oil per day. There’s no small bit of irony here. A century ago, populists on the left rose to prominence by condemning the moneyed interests, and in particular, the big banks and the railroads. The Populist Party Platform of 1892 said that “the people must own the railroads.” And yet now, in the name of reducing carbon dioxide emissions, the environmental left could hand the railroads a major windfall and get nothing in return but a symbolic victory. 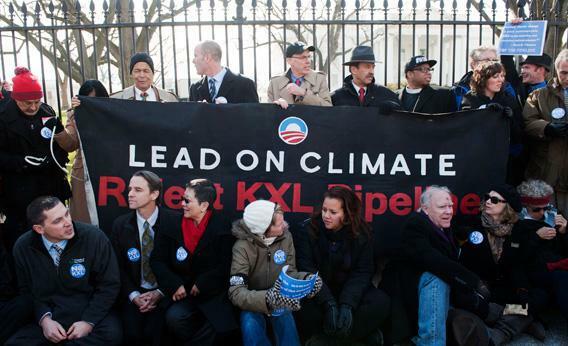 Condemning the oil industry, holding rallies, and getting arrested at the White House is easy. Preventing the world’s single most important commodity from getting to the marketplace? That’s a lot harder.